Assume you want to export all of your Google Chrome favourites to some safe place regularly to prevent loss of them. Backupery for Chrome Bookmarks is here for that. It is a small but powerful “set-and-forget” backup tool designed especially for making backups of Google Chrome bookmarks. The application makes regular backups of your Chrome bookmarks and safely stores them in different places such as internal/external hard drive, USB thumb drive, Dropbox/Google Drive/Microsoft OneDrive directory, etc. Download Backupery for Chrome Bookmarks on the computer where Google Chrome is installed. Double-click the setup file, and then follow the instructions on your screen. That is all. Now all your Chrome bookmarks are backed up regularly to the location shown on the Settings page. Of course, you could change the backup location at any time just by selecting another backup directory. You could choose any directory on your desktop or laptop, or some folder on your USB stick or hard drive, or use any directory that is synchronized with any cloud storage of your choice (Google Drive, Microsoft OneDrive, Dropbox, etc.). 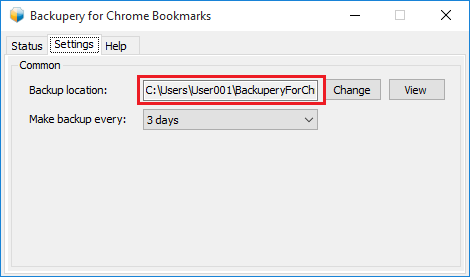 If you are interested in how to restore Chrome Bookmarks from the backup snapshots, see the following article: How to Restore Google Chrome Bookmarks Using Backupery for Chrome Bookmarks. To start protecting your Google Chrome bookmarks download Backupery for Chrome Bookmarks now.